Alborada is a beautiful 3 bed,2 bath beachfront apartment with air con, WiFi, smart TV, garage and close to all amenities in Guardamar Del Segura on the Costa Blanca. 35mins from Alicante airport. This 2 bedroom villa is located in El Moncayo and sleeps 5 people. It has WiFi, air conditioning and parking nearby. The villa is near a beach. This bright apartment with communal pool extends over 2 floors and is just a 5-minute walk from one of the few pristine beaches with natural sand dunes on the Costa Blanca. This single-storey, modern, furnished holiday apartment is located in El Moncayo and offers two terraces where, depending on the season, you can find a sunny or a shaded spot. This 3 bedroom apartment with swimming pool is located in Guardamar del Segura and sleeps 6 people. The apartment is within walking distance of a beach. This 3 bedroom apartment is located in Guardamar del Segura and sleeps 6 people. The apartment is within walking distance of a beach. This is a beautiful apartment with a lift and a covered terrace on the 2nd floor. The apartment has a cosy living room with flat screen TV and DVD player and a well-equipped kitchen. This functional holiday apartment, with everything you need to spend a great holiday. This lovely attic apartment offers a magnificent view of the sea and the surrounding shaded pine forest from its rooftop terrace. It also has easy access (15 minutes) to the beach. This is a fantastic holiday apartment next to the nature park grounds, which is only about 10 minutes walk from the beach with its own stretch of coastline for nature lovers. From the beautiful large roof terrace of this apartment, you can enjoy a wider view of the lemon grove. Nice and quiet holiday apartment with access to the communal pool of a complex in Guardamar del Segura on the Costa Blanca. In a private urbanization this cozy holiday apartment is located with a great terrace and direct access to the communal pool. 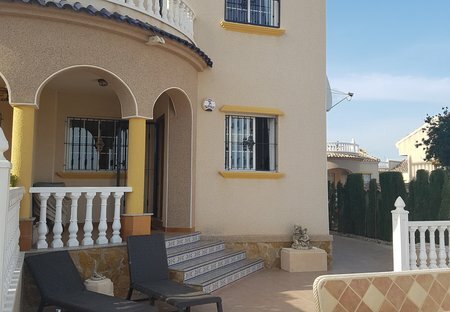 This quiet holiday apartment with glazed terrace in Guardamar del Segura on the Costa Blanca is located in a natural environment only 600 meters from one of the most beautiful unspoilt areas of the. This 2 bedroom apartment is located in Lomas de Polo-Pinomar and sleeps 4 people. Nestled at the mouth of the Segura River, between Torrevieja and Santa Pola, Guadarmar del Segura (or 'Guardian of the Sea') as it's known is Spanish, is a district in Alicante Province with a population of just over 11,000. It lies in the Costa Blanca's south on a hill over the Vega Baja, with a diverse landscape of sand dunes, pine forests and eucalyptus. Discover over 12km of coastline with a year-round Mediterranean climate, an abundance of water sports and a long stretch of high street where you can find everything from restaurants to shops and a bustling traditional market scene. The marina is part of the Corredor Verde del Guadamar cycling route, which runs along the Guadiamar River, where you can enjoy scenic views of the coast and landscape. The route is also located next to two beautiful parks; Reina Sofia and Alfonso XIII. Enjoy a camel ride along the coast, take a tour to the San Antonio Windmill or sit back and relax on one of the many Blue Flag beaches. Follow the wooden walkway through the dunes to the port and enjoy a refreshing dip with the family along the way. For more choices, the fine sands and salt lakes of Santa Pola are just a 20 minute drive away. Discover rentals in the heart of it all; villas with private pools and sea views, to family-friendly apartments walking distance from the golden sand beaches, shops and local amenities. A direct flight from Alicante Airport takes approx. 2.5 hrs, with a 45 min drive from the airport. Guardamar enjoys a beautiful micro climate. August is the hottest month with an average temperature of 27°C. The average sea temperature in summer is 26°C. Guardarmar del Segura is surrounded by 2 beautiful salt lakes which form an official Spanish nature reserve. Market day is every Wednesday morning. Don't miss El Passo's 'Lemon Tree Market', with over 500 stalls!